You'll need a cup of herbs in total, but feel free to vary it by what you like and what's available. Run your fingers down the branches of the herbs to remove the leaves. If there are any flowers, set them aside for a garnish. Cut off the sorrel stems and slice the leaves in narrow ribbons. Chop the rest of the herbs fairly finely, but leave some texture. Put the herbs and shallots into a bowl with the extra-virgin olive oil and the butter and set aside. Bring a large pot of water to a boil for the pasta. When the water boils, salt to taste and add the pasta. While the pasta is cooking, fry the breadcrumbs until golden and crisp, and season them with salt and pepper and a few pinches of chile-pepper flakes. When the pasta is ready, scoop it out of the pot and add it to the bowl with the herbs, oil, and butter. Season generously with pepper and toss well. 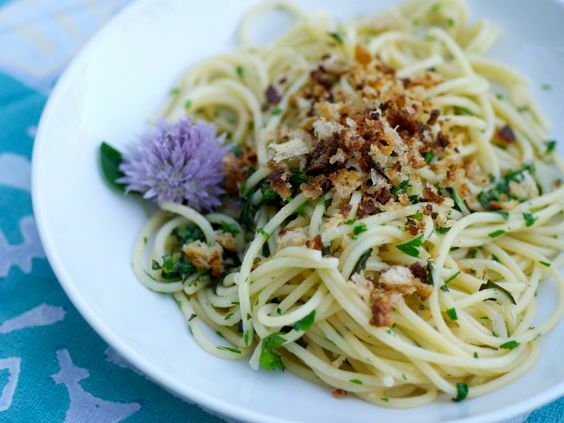 Serve immediately, with the breadcrumbs strewn over the top; garnish with herb blossoms if there are any.